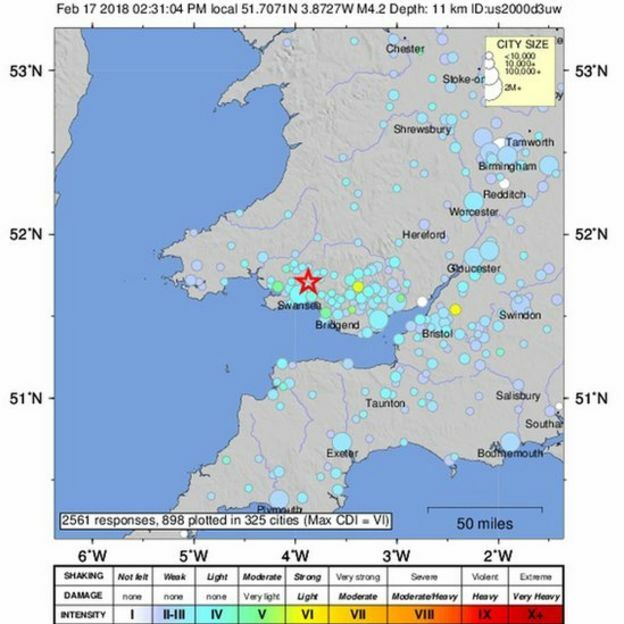 A minor earthquake with a 4.4 magnitude has affected parts of Wales and England. The quake was felt over all of Wales, most of western England, as far east as London and as far north as the southern edge of the Lake District, the British Geological Survey (BGS) said. The epicentre was approximately 20km north-north-east of Swansea and at a depth of 7.4km, it added. Events of this magnitude happen in the UK every three to five years, the BGS said. 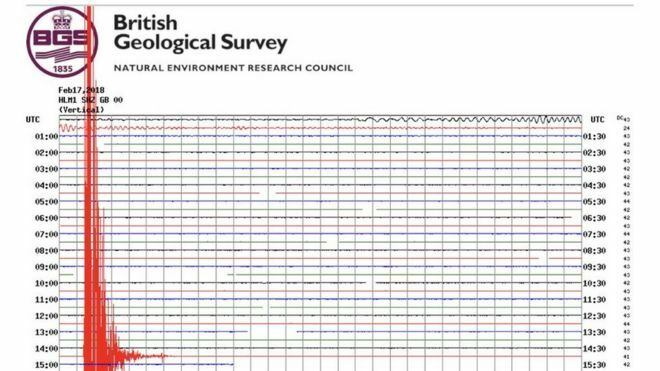 Roger Musson, from the BGS, said it was the largest earthquake in mainland Britain for the last 10 years – since one with a magnitude of 5.2 struck in 2008 in Market Rasen, Lincolnshire. He said it was “relatively shallow” for a larger British earthquake. They are usually around 15-20km deep. 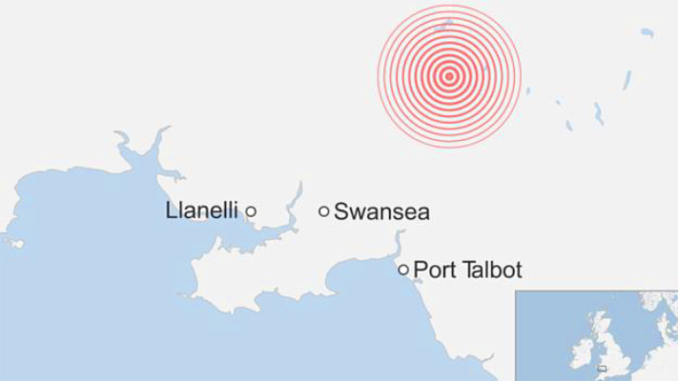 Dyfed Powys Police force said it had received “an extremely high volume” of calls relating to tremors. 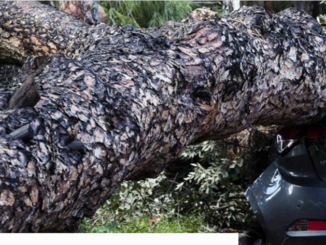 South Wales Police urged the public to avoid calling the emergency services unless it was to report damage or injuries. The tremors caused play to be held up at a Welsh Football League match at Port Talbot, 10 miles from Swansea, as the town’s team faced Taff’s Well. 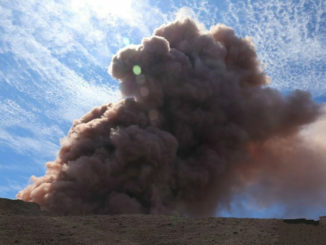 Steven Clathworthy, who lives near Bridgend, south Wales, said he heard a bang and the settee moved. “All the neighbours were out asking ‘what’s happening? '” he said. Vera Sanderberg, from Croyde in north Devon, said she felt her house shake. “The neighbour’s horses bolted,” she said. In Cheltenham, Paul Samway said it felt like “a washing machine breaking down”. “We heard the walls crack and there was a bit of juddering,” he added. Louise Craig, from Connah’s Quay in north Wales, said it was “the most excitement I’ve had on a Saturday afternoon for a while”. “I get a lot of fat wood pigeons jumping up and down on my chimney and I first of all thought the noise was them but they must have put on a heck a lot of weight to make the house shake,” she told the BBC. 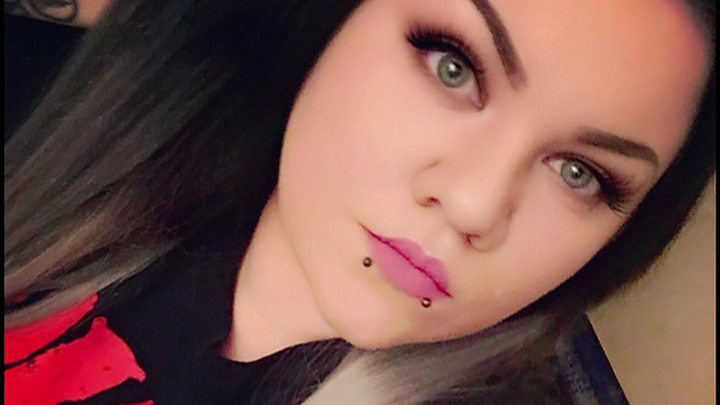 Donna Johnson in Caerphilly said she was “really scared”. “The house started rocking, and I said, ‘oh my god the house is falling down’. 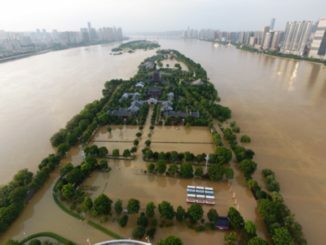 We have a bungalow, and there is risk of subsidence here,” she told the BBC. Sue Field in Shifnal, Shropshire, said she felt the tremors from her armchair. “I thought I’d had one too many wines for my birthday lunch,” she said.